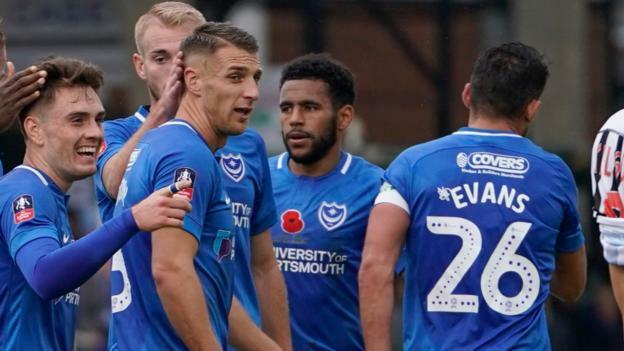 Ben Thompson’s first Portsmouth goal helped the League One leaders ease past National League side Maidenhead 4-0 in their FA Cup first-round tie at a packed York Road. The Millwall loanee scored just before the break with a sweetly-timed strike from 12 yards after being found by an excellent low cross from the left by Ronan Curtis, who was in fine form all afternoon. Gareth Evans was Portsmouth’s other major threat and his beautifully clipped cross on the right byline in the 55th minute found Oli Hawkins, who looped a far-post header beyond Maidenhead goalkeeper Carl Pentney. The current highest-ranked side in the competition put the result beyond doubt four minutes later as a header across goal from centre-back Jack Whatmough was just behind Hawkins, but Jamal Lowe swept in the loose ball. Maidenhead had defended with great application up until the first goal, but conceded a fourth seven minutes before full-time. Lee Brown’s free-kick was parried away by Pentney but the rebound was put away by David Wheeler’s diving header.